Play 6v6 in coned area just outside 18yard box, , can player break out with a leven play (dribble trick), one two, over lap etc. once out they have 3 seconds to score. progress to allow defender to go in and chose. 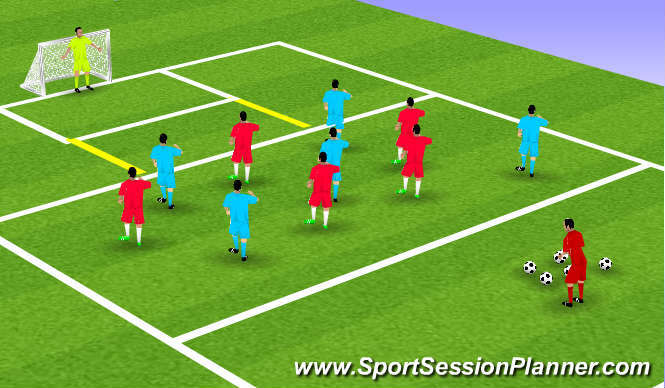 2nd progression if a player breaks out into the wide position (out side 18 yard box) a second striker can go into finish from cross (1touch). Quick and clever play, dribbling skills, vision & awarness, decision making, quality of finishing. Decisions when to play forward, when to overlap etc. creating space, quick finishing. Anaerobic high tempo session, short shap movements. Positive thinking, who dare play forward runs (most productive but dangerous) positive to finish chances. The players showed inventiveness and clever play in breaking out of area to getinto goal scoring position. Initially the finishing was poor but improved as the session progressed (players placing finishes in relation to the goal keeper than just head down shooting).